Shawn Fortner brings seven (7) years of experience in commercial real estate on the landlord side. She specializes in leasing for national and local retailers with prominent shopping centers and high street retail. 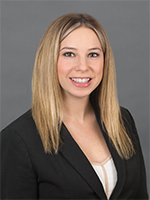 Shortly after graduating from The Ohio State University with a BSBA in Real Estate, Shawn joined Glimcher, where she focused on leasing Class A malls and lifestyle centers across the country. She was involved in closing deals with prestigious national retailers such as American Girl, Design Within Reach, Warby Parker and Vince & Joie. In 2016, Shawn moved back to Cleveland where she was hired by DDR to handle the leasing of nearly five million square feet of retail space in power centers. Shawn was brought on by Cushman & Wakefield | CRESCO Real Estate in 2017 to grow its retail sector. She has since closed deals with major national retailers including Chase Bank and unique regional retailers such as Whistle & Keg, a Youngstown based craft beer tasting room. SNOW PLAZA 11717-11729 Snow Rd. GANDER MOUNTAIN 2695 Creekside Dr.
SETTLER'S POINTE 1400 W. 10th St.